From $3900 / person | Comprehensive package including accommodation for all nights, in-country transport by private bus, train, or flight, lecture and instruction materials from our expert guides, all activities as listed on the itinerary, and 3 meals per day. *International Airfare and Visa Fees are not included. Embark on a journey through the exotic landscapes of Southern Africa, - visiting Botswana & Zambia (and Zimbabwe). 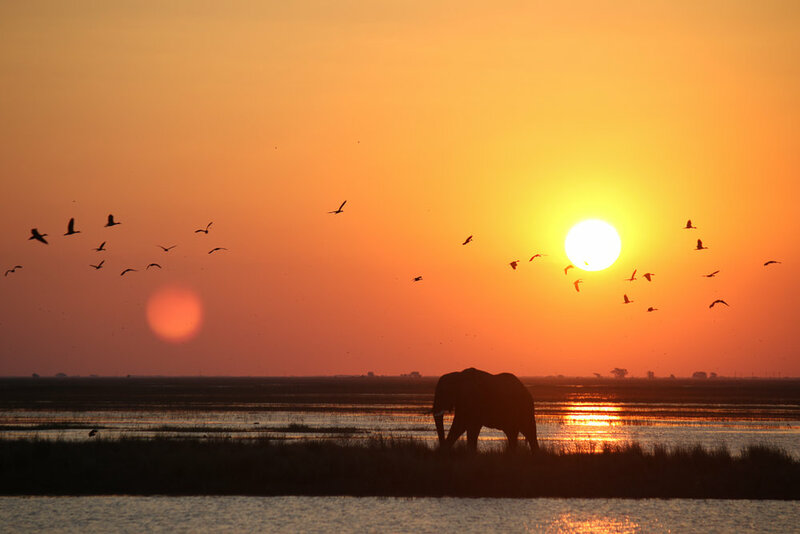 Experience the culture, wildlife, and stunning scenery of three of Africa's most picturesque countries with visits to breathtaking locations, such as Victoria Falls, Chobe National Park, and the Okavango Delta. You’ll feel close to the heart of the savanna while visiting some of Africa’s most beautiful destinations. After a pleasant flight routing through Johannesburg, we’ll meet in Maun — a city in Botswana's Okavango Delta that’s brimming with beauty and wildlife. We’ll check into our accommodations at 2pm and adjust to the time change with an introduction to the countries we’ll be exploring and wildlife we’ll be seeing throughout the trip. Afterwards, we’ll set out to explore the bustling city, visit the vibrant markets, and enjoy a traditional welcome dinner. It’s time to say goodbye to Maun as we head deep into the southern savanna. While riding in private Jeeps, we’ll venture into the wilderness and embark on a once-in-a-lifetime adventure. We’ll spend the next five days exploring the unfathomable beauty of the Okavango Delta, Savuti, and Chobe National Park; scour the safari for its abundant wildlife, canoe in traditional wood-carved boats through narrow channels, and immerse yourself in the local culture of remote tribes. After busy days, gaze upon breathtaking, fiery sunsets before gathering round the campsite to share your adventures under a sky full of stars. The Okavango Delta is one of the most expansive wetland systems in Southern Africa and offers spectacular game viewing and a wide variety of birdlife. Canoe in traditional wood-carved boats through the narrow channels of the Delta, coming up close and personal with hippos, bathing lions, herds of zebra, and extraordinary birdlife. Be prepared for some of the most spectacular scenery and animal encounters you have ever witnessed. This morning we will head deep into the Savuti Marsh, a large inland lake fed by the Savuti Channel. Here you will experience rolling savannah that attract many different animal species – including the main predators such as lion, leopard, hyena, wild dog, and cheetah. During our game drives we hope to see many of these predators who are more active in the early mornings and in the evenings. The inaccessibility of the region offers an unique experience, and being out in the wild enhances the feeling of exhilaration of being so close to Mother Nature. Imagine seeing more than 500 elephants, thousands of buffalo, and countless other species on a single safari drive or river cruise. Welcome to Botswana’s legendary Chobe National Park, simply the finest big-game viewing place in Africa. The Savuti is a region within the heart of the Chobe National Park that is secretly located away from the peak season crowds at the Chobe riverfront. The area is renowned for its large population of bull elephants and visiting Savuti offers the chance of witnessing the unique interaction of the resident predator species. Embark on game drives to capture the animals against the beautiful light of the Savannah – a memory that is not to be forgotten. Chobe is one of the most famous safari lands in all of Africa, and is hope to numerous animals. In the afternoon we will board our safari vehicle in search of lion, leopard, hyena, elephant, giraffe, and a host of antelope and bird species. The Chobe National Park is an essential wildlife destination while on safari in Botswana. The floodplains provide a feeding ground for herds of elephants (it is not uncommon to see between 500 to 2000 Elephants on these plains at one time). The combination of wildlife, birdlife, and reptiles along the river's edge is a photographer’s dream, and our two game drives today will give us plenty of time to explore it. After breakfast, choose from one of many ideal spots to do absolutely nothing. Relax, and enjoy this uniquely special place, before you say your goodbyes to Botswana, and set off to Zambia, home to one of the Seven Natural Wonders of the World – Victoria Falls. We’ll spend the afternoon visiting these magnificent waterfalls. You’ll have the option to participate in popular activities, such as bungee jumping and gorge swinging from the famous Victoria Falls Bridge (at an extra cost). On our way back to Livingstone, we’ll have the unique opportunity you’ll meet local villagers, learn about the tribal culture, and utilize your photography skills to capture the unforgettable beauty of this country. It’s time to say goodbye to Africa’s bewitching beauty. After breakfast, we will check out of our hotel prior to 11am and travel to the airport to catch our flights back home; if you’re not ready to leave just yet, continue on to your next magical destination (see packages below). Experience the beauty of Zambia and Zimbabwe on this extended visit to Livingstone and Victoria Falls. Visit remote villages, meet local tribes, visit wildlife reserves, and cross borders from Zambia to Zimbabwe to experience the differences in culture, cuisine, and even nature. You will have time to visit both the Zambian Side of Victoria Falls and the Zimbabwe Side, and take a beautiful boat cruise along the mighty Zambezi River. + What are the accommodations like? + How safe are the safari vehicles? All our Safari Vehicles are sturdy 4x4 Jeeps that fit 8-12 people comfortably. They are the standard build of vehicle used for all Safari's in Africa and are completely safe. + What type of food will I be eating? The food while on safari is prepared by your private camp chef, and can range from pasta and vegetables to simple meat dishes served with a side of rice. All of the food is prepared to Western Standards and is safe & delicious to eat! + Is it safe to camp while on safari? Mobile Camping Safaris are safe, as there are only a few designated campsites to be used by small groups (and all the sites are watched over by Park Rangers). 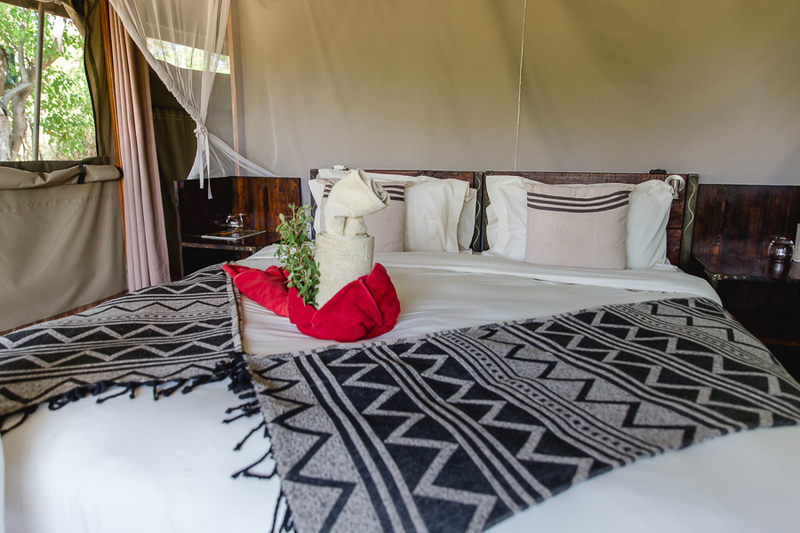 The sites must be booked in advance (as they are full all throughout the year with tourists), as many people choose a mobile camping safari over a standard lodge experience. + When is the best time to see animals? The wildlife in Botswana is always great (as they have strict anti-poaching laws) and anytime you visit throughout the year is guaranteed to give you a great experience. The Spring (April-June) is a great time to visit as the wildlife is abundant. Summer (July-August) is also great for wildlife viewing, just expect more tourists. Fall (September-November) is the dry season, which means that the animals cluster around the watering holes for easily spotting opportunities. The Winter (December - February/March) is the wet season which means the opportunity to see newborn wildlife (and also experience some brief rain showers). + Why do a Mobile Camping Safari? A Mobile Camping Safari is one of the best ways to experience the wildlife because you are located in the best locations in the park (which means you will at the prime locations during sunrise and sunset when the animals are the most active).